What does a year’s worth of laundry soap look like? I have made homemade laundry soap a few times. Once I made liquid, and HATED it, because it was so….gloopy and sloppy. But this stuff? I love it! It smells great, cleans really well, and for under $30, I will have enough to last for a year (doing laundry for 3 of us, so around 6-10 loads a week). I have read several articles about this, and yes, it is safe for HE washers. You only need to use 1-2 tablespoons for each load. Here is what it takes. The biggest job is grating the soap. I always use my food processor. I shred it using a shredding blade, then I put it back in the food processor with the S blade and some of the baking soda, and blend it. Then, you need a really, REALLY big container to mix it all in. A 5 gallon bucket with a lid is perfect, so you can just mix and shake right in the bucket. A dishpan also works. Just dump everything in and shake/stir…whatever it takes to get it all blended together well. The entire process took less than 30 minutes. Save the Oxi clean container, and the laundry crystal containers, and anything else you can use to store it in. Use 1 tablespoon for small loads, and for large loads use 2. If I see a stain, I will pretreat with a laudnry spray. Overall, we are VERY happy with this stuff. Ok, I know this is a random post after having been silent for so long. I’m not even going to try to promise to do better. I will try! I spent today trying to track down all my recipes for homemade mixes. I have some in my gmail, some on index cards, some on pinterest boards, etc. I decided to put them all here, in one place, so I know where to find them easily. Taco seasoning mix, Italian dressing mix, Ranch dressing mix, Greek seasoning and Cream of chicken soup mix. The mix that I go through the most of is taco seasoning mix. It is so easy to throw together, and SO much better than the store bought packets! I usually multiply the recipe by 10 and make a really large amount and store in a pint mason jar. (The measurements in parenthesis are the amounts when multiplied by 10) I use 2-3 T. when a recipe calls for taco seasoning mix. I also sometimes add jalapeno, habanero or cayenne pepper to the mix, depending on who I’m cooking for. Italian dressing mix is another often used mix. Making it myself just tastes SO much better than the little packets. It is also quite a bit less expensive when you make it on your own! I have a smaller container for this, so I don’t usually double this one…it’s just what fits in my jar! I sometimes cut down on the sugar in this. I use 2 T. when a recipe calls for a packet. And this one is fairly new …I just made it today! I plan on using it to make OPA! fries…mmmmmmm. And finally, I made a big jar of homemade cream of chicken soup mix. I have been making this stuff since our seminary days (that goes all the way back to the early ‘90s!) I also make a batch using beef bullion if I’m going to want cream of mushroom soup for beef based meals. To make 1 can of cream of chicken soup, mix 1/3 cup dry mix with 1 1/4 cups of water. Whisk together in saucepan, and stir til it boils and is thickened. Add it to the recipe that calls for cream of chicken soup. Do you know what Braunschweiger is? I can remember being VERY young and hearing my dad “sneak” to the refrigerator in the evening. I would follow, knowing he was going to cut off a hunk of braunschweiger to snack on. If I caught him, he’d cut off a hunk for me, too (bribery to keep me from telling on him!) Mom would pretend to be annoyed when she’d see the half a hunk left in the fridge…”Who ate all the braunschweiger?” Dad and I would just grin at each other, knowing full well that mom knew the truth. Sue Ann, did you ever get any? A couple of years after my mom died (SIXTEEN YEARS ago yesterday…wow…where did the time go? ), my dad remarried. Dorothy made my dad really, really happy for almost ten years! They loved life together, and had lots of fun dancing the years away. We love her SO much for that! And she made US happy for many reasons…she made dad happy, she loved us, loved our kids, AND… because she introduced braunschweiger dip to our family! It is now a standard dip at Confirmation parties, birthday parties, Thanksgiving appetizers and New Year’s Eve. You just gotta try it! Blend all together (I usually throw it all into the food processor and process til it is smooth) and chill. Serve with Wheat thin or Triscuit type crackers. It is also good with pita chips! Thanks, Dorothy! We love you! There is one item on the menu, however, that will cause a revolt if I skip it. All of my kids (except one), and my hubby, and my sister just LOVE sweet potato casserole. I like it, too. This is one holiday recipe that will be on my table every single time. The main course may switch from turkey to ham, and the salads may be switched up a bit, but this one…it will be there! It’s SO good! I decided to add some of the family favorite holiday recipes to the blog, for the sake of my children (um…Rachel) who might want to replicate a holiday dinner “like mom used to make”. I guess I will have to update the blog next year, when I actually TAKE a picture of the sweet potato casserole! But for now, the recipe alone will have to do. Beat all casserole ingredients together. Pour into a greased 9 x 13 pan. Mix brown sugar, butter and flour. Sprinkle on top. Top with pecans. (I usually leave the pecans off) Bake at 350 for 35 minutes. Top with marshmallows Bake 10 minutes more. Make a pizza braid. It is seriously one of the easiest things to make, it never fails to impress, and it always disappears super quickly! Anyway, for the Cross Country awards banquet, the families of the runners have a potluck. (just fyi, this was our 9th or 10th year in a row to attend this banquet!) Tonight, I made a couple of pizza braids. 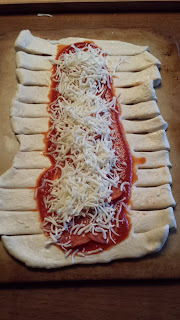 Several years ago, I made ONE pizza braid for the potluck. It was gone after the first 6 people went through the line. So this year I made 2. I still didn’t get any (and it smelled REALLY good in the car on the way there!) Next time I might make FOUR! 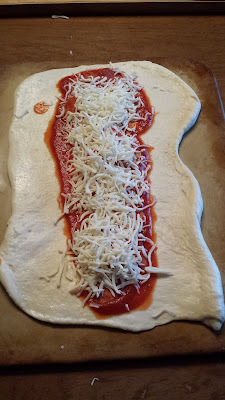 Spoon pizza sauce down the center of the dough. 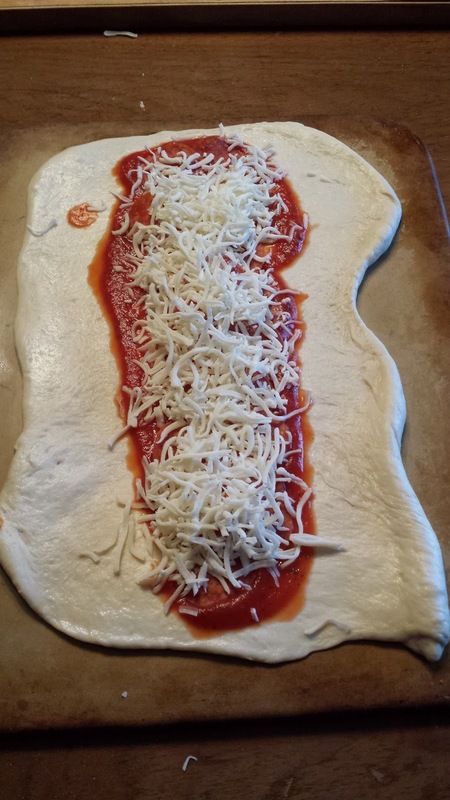 Then (optional) add slices of pepperoni (this is really good with just cheese, too!). Top with shredded mozzarella. Next, cut slices, about 1 inch apart, along the sides. 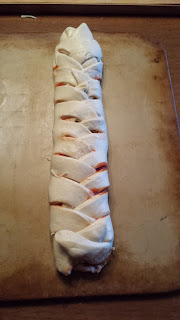 Criss-cross the sliced dough, alternating sides, and overlapping just a bit, so that it looks like a braid. I didn’t take a picture of this step, so I hope you can “picture” what I mean. Tuck the ends in to make it look nice, if you wish. I don’t have good luck with this part. Bake in a 375 oven for about 20-25 minutes, or until it is golden brown. While it is baking, melt some butter in a pan, and add minced garlic. For 2 braids, 1/2 of a stick of butter and a huge tablespoon of jarred minced garlic was just about right. As soon as it comes out of the oven, brush the melted garlic butter on top. Keep brushing. LOTS of garlic butter makes this OVER the TOP yummy! 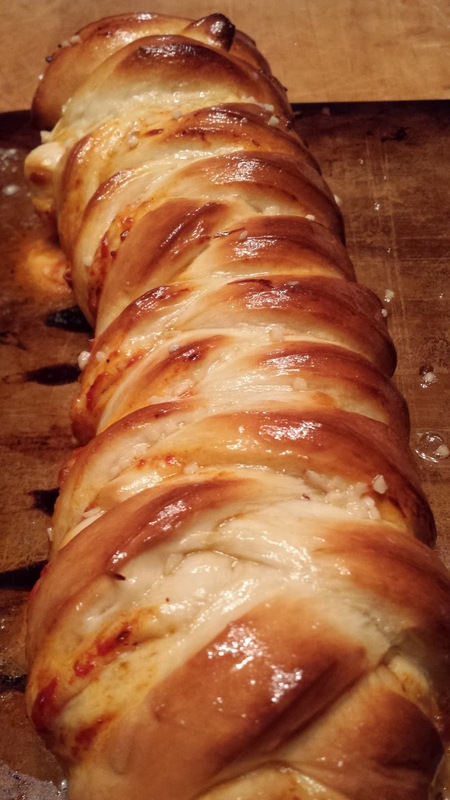 You can make someone’s day, too, if you make them a pizza braid! Well…how did that happen already? Most of you know how much I love summer time! I love the heat, the sunshine, I love late nights and sleeping in, I love having a laid back schedule. I love summer! It never lasts long enough for me. And now, it’s already time to send Rachel back to college! She has to move in on Tuesday. It seems like I just traveled to MI and moved her home! She’s had a busy summer working at the pool. This was her FIFTH year as a lifeguard! She does a great job. She has a “look” (some of my Tuckerman family know EXACTLY what “look” I’m referring to!) that scares many children into following the rules. She’s working her final day there today. Rachel did learn to knit this summer. She learned from Isaac, a fellow lifeguard. He taught her how to knit using bamboo skewers. Stay tuned for a picture of a project sometime! It is a bittersweet time for me. I love watching her grow and flourish at Concordia, where I know she’s going to be an absolutely FANTASTIC RA. But wow..I sure do miss the gal when she’s gone. Fishing…a good time, even when nothing was biting! Cousins, and future DORM MATES! Woo HOO! Super fun time with family! Working together as lifeguards this summer has given them a special relationship. I think Ethan got this look a LOT! We love it when you use your talents! God has blessed you with a beautiful ability to play piano and organ! We went to see Les Mis at the Cedar Rapids Theater! AMAZING performance. 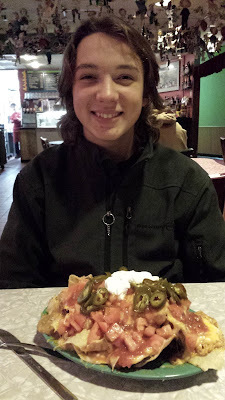 At Split Rock for Hobo dinners. Dad cooked them perfectly! And Moses enjoyed the outing, too! We pray that your sophomore year is fantastic beyond your wildest dreams, Rachel! There has been recent discussion about crock pot meals among some of my friends. My family’s favorite “Crock Pot Mac and Cheese” came up, so I gave that recipe out a few more times. The best part about that recipe is that you do NOT cook the noodles first. You can put it together in moments, and then walk away, and 2 1/2 hours later, you have dinner! Who doesn’t love that? Spray crock or line with crock pot liners (BEST INVENTION EVER!) Place layers in crock pot: Sauce, noodles, sour cream/cottage cheese mixture, mozzarella cheese. Repeat layers til you are out of ingredients or the crock is full. Cook on high 4 hours. If the sauce seems super thick or things don’t seem to even out well, I will sometimes add a cup of boiling water, just to help the noodles cook. Another family favorite! Thanks, Aunt SueAnn! These are the beers of my life.